The existence of the Russian Skazki or Märchen (Stories, Folklore or Fairy Tales) was first made generally known to the British Public in about 1880 by William Ralston in his Russian Folk Tales. 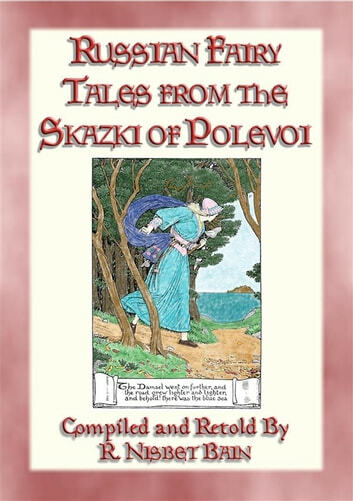 A year after the appearance of Ralston's book, the eminent Russian historian and archæologist, Peter Nikolaevich Polevoi selected, from the inexhaustible stores of Afanasiev, some three dozen of the Skazki (stories) most suitable for children, and worked them up into a fairy tale book which was published at St. Petersburg in 1874, under the title of Narodnuiya Russkiya Skazki (Popular Russian Stories). To manipulate these quaintly vigorous old world stories for nursery purposes was, no easy task, but, on the whole, M. Polevoi did his work excellently well, softening the crudities and smoothing out the occasional roughness, turning these charming stories into entirely readable stories for children. As to the merits of these Skazki, they must be left to speak for themselves. So, we invite you to down this book of 24 unique Russian Fairy Tales and curl up in a comfy chair with a mug for of steaming hot chocolate and be whisked away to a country that is still as mysterious as it is large. 10% of the profit from the sale of this eBook will be donated to charities.